Mumbai Magic is a traditional, instant-win scratch card game. The developer is Microgaming, which you may already know from its successful slot games. It seems scratch card games are their specialty too; because Mumbai Magic is one of the most entertaining scratch card games we ever played. 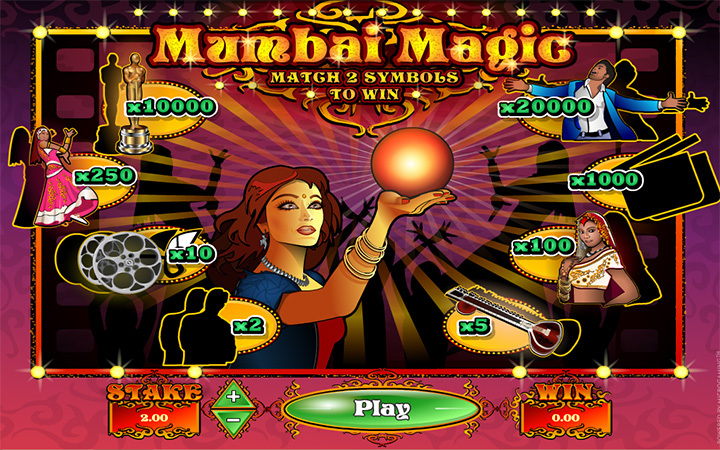 The game uses a Bollywood theme, as you can guess by the name. There is a beautiful lady in the middle, who is holding a magical ball. When you click on the “play” button, six Bollywood related symbols will pop up from the ball and appear on the interface. Your goal is to catch at least two of the same symbols at each round. If you have played a lottery game before, same rules apply here. Before starting the game, you need to set your bet for each “scratch”. This value can be set between 0.50 and 10.00 coins. Bet values are important in scratch card games, because their payouts are in the form of multipliers. The symbols do not have cash values, instead, they award with multipliers, such as 2X or 100X. In other words, you need to play with the maximum bet values to win the maximum prize. The symbols in the game pay between 2x, 5x, 10x, 100x, 250x, 1000x, 10.000x and 20.000x. For example, if you play with a bet value of 10.00 coins and hit the jackpot, you get to win 200.000 coins instantly. After setting your bet, start the game by pressing the “play” button. As we mentioned above, six symbols will appear on the interface. If two of them are the same, you win the multiplier value of that symbol and multiply it with your total bet. The result is your payout. If you don’t get a winning combination, simply start another round by pressing the “play” button again. The game has a very fast pace and you can complete a couple of rounds in one minute. Payout values are high and the game looks nice – Mumbai Magic is one of the good examples of this category. Highly recommended.